Near intersection of 14 Avenida, 13 Calle Zona 10, / not felt: I was sleeping and did not awake. 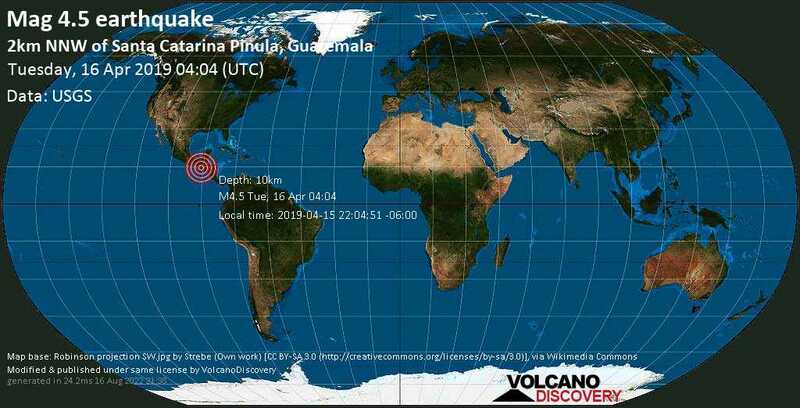 However, around 3:50 pm on 16 Apr 2019 I felt a series of short and long tremors for the next ~6 minutes while seated at my office on the 2nd floor of an older building in Zona 10, Guatemala City next to Plaza Fontabella on 14 Calle. Antigua Guatemala city center / MMI IV (Light shaking): Was in bed. Slightly stronger than all the small earthquake experience I had. Worried me for a short while but hen passed quickly (~5sec). Nothing broken in the house. Parramos / MMI V (Moderate shaking): At NPH Guatemala home in a dorm and all beds shook for 5+ seconds. Dogs barked like crazy outside. Amatitlán, Guatemala. / MMI VI (Strong shaking): I was almost going to sleep when it happened. I felt some roof fragments fell on me. Antigua Guatemala / MMI VI (Strong shaking): I felt a little one before this one. We got out of the house. Dogs barking a lot. Guatemala city, oakland mall near / MMI IV (Light shaking): Felt the shaking lying on the bed. Some rattling sound. Ciudad Vieja, Sacatepéquez, Guatemala / MMI IV (Light shaking): A little stronger than the more recent tremors. Antigua Guatemala / MMI IV (Light shaking): Five + second shaker. Went a little longer than most. House noticeably shook, keys in door rattled. Felt deep and rolling, no sharp jolt.